This beautiful picture of Jupiter was assembled from three separate images acquired by Nasa's Juno spacecraft as it made another of its close passes of the gas giant. 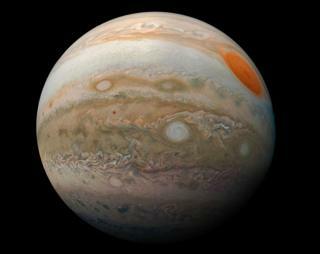 The US space agency has dubbed it "Jupiter Marble" - a reference to the full disc pictures of Earth captured by satellites down the years that have been called "Blue Marble". The Jupiter mosaic includes shots taken between 26,900km and 95,400km from the planet's cloud-tops.